On April 30, 2013 Twitter announced that Twitter advertising is now available to all U.S. accounts. Previously it was invite only. Now using their self-service ad platform we can all promote our brands, big or small, on Twitter. Advertising on social networks is structured in some ways like PPC (the Google search advertising format many of you are accustomed to). However, you will only be successful if you understand how to engage people in the communication format they are used to. Social advertising is great because you have more features at your fingertips than you would with traditional advertising to leverage earned media and engagement through conversations. You’ll want to start with a goal. Do you want to get new followers (acquisition) or entertain your audience (engagement)? Both are equally valuable depending on what your business needs are at the moment. Nailing down this simple direction will determine the right program. 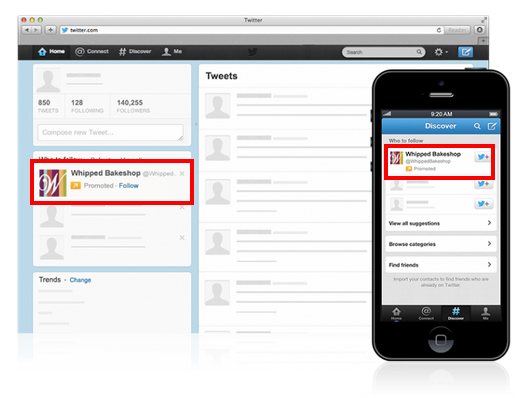 Hubspot recently shared an article that breaks down how Twitter’s self-service ads work. And not to brag, but we were one of the brands invited to check out Twitter ads when they first came out. Rob shared his experience and provided Twitter advertising tips for small businesses on our blog awhile back. Since they’ve already covered the basics, we want to dive in a little deeper and focus on the strategy of how-to advertise on Twitter. Once you decide what your goals are for using Twitter ads you will have a better idea of what kind of ads you’ll want to run. Read further to find out how. Twitter has three types of ads your brand can run in the form of Promoted Accounts, Promoted Tweets and Hashtag buys. Promoted Accounts will get you followers and requires no creative. Promoted Tweets create engagement around conversations driven by your brand. Hashtag buys cost well over $100,000 for a 24-hour run. We’ll leave the latter to bigger brands and dive into the two that are used by most businesses. Having a point of reference is helpful and will make the most of your advertising budget. About hashtags: You do not need to do anything special to create one except to simply begin using it. Hashtags do not contain spaces or special characters and are not case sensitive, and always contain #. Hashtags are used to aggregate conversations and are clickable within a Tweet. Explore some at search.twitter.com to see what people are or are not talking about. A unique hashtag that is not in use is highly trackable and brandable. Just like with the Promoted Accounts, you only pay for engagement (i.e. when some our Tweet is retweeted, favorited, shared or click on your promoted link). Everyone loves to see their numbers grow. Social media measurement helps to ensure your program is justifiable to upper management and provides you insights to make you better at doing the job. Luckily, Twitter ads provide a real-time dashboard that provides the metrics of your campaign. It displays impressions, number of clicks, click rate and how much you spent. The growth chart is easy to read. In this particular example, you are able to see a report of new followers from your organic efforts and new followers as a result of promoting your account. As a bonus here are a few expert tips from Fandom’s media planner Greg Lantz. Your goal should help you determine which type of Twitter advertising to use. If your goal is more followers then Promoted Accounts are a better choice for your campaign. But if your goal is engagement, perhaps to promote a contest or drive users to discover something on your website, Promoted Tweets offer a more direct way to tell your potential customers what you would like them. Make sure Promoted Tweets use “tweet lingo” and are not too direct response oriented, or customers will avoid clicking on your ads because they are being sold to too much. Promoted Accounts will be volatile the first few days in how many impressions you receive. Expect a very large volume of impressions and spend the first day or two, with a rapid tapering off of spend shortly afterwards. Twitter seems to reward campaigns that receive high follow rates by showing the promoted account more often. Twitter is not an inexpensive advertising channel. It can be tricky too. Be sure who ever is tasked with managing your ads is familiar with paid media, the Twitter ad platform and tweeting. It is critical that they optimize your media spend to get to your target acquisition or CPC price. Ad dollars are not something to be played with and I’ve unfortunately watched budgets go down the drain from inexperience. Get educated or get the right expertise on your team so it doesn’t happen to you! If you have questions feel free to leave a comment or Tweet us @fandommarketing.